A Central Venous Catheter (CVC), also fame as Central Line. It is a thin and flexible tube that is inserted in to large vein in the neck, or chest to monitor chemotherapy drugs, intravenous (IV) fluids, antibiotics, blood and platelet transfusions, parenteral nutrition, etc. to give medicines fluids, nutrients, or blood products when the patient under observation is suffering with diseases such as cancer, cardiovascular diseases and renal failure and traditional way of providing medicines or nutrients not performing. The Central Venous Catheters are used for monitoring the hemodynamic variables and measuring the central venous pressure. The patients who are suffering from cancer, various chronic disorders, and gastrointestinal diseases will require high immune nutrition which is provided through catheters and thus increasing in the demand. The rapid growth in the number of hospitalizations coupled with the high acquisition of the CVCs that augments the growth of the Central Venous Catheters Market. 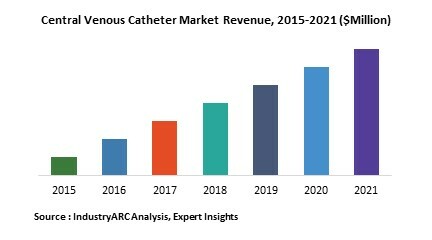 The important growth drivers for the Central Venous Catheters Market is the increasing number of cardiovascular and cancer patients, aging population, and people who are suffering from many different chronic disorders are the prior factors that are driving the Market of Central Venous Catheters. Central venous catheters remain a crucial for access for patients receiving maintenance hemodialysis. There are many vital and evolving clinical and regulatory considerations for all stakeholders for these CVCs. Innovation, transparent and comprehensive regulatory review of these devices is essential to stimulate innovation to help promote better output results for patients receiving maintenance hemodialysis. A workgroup that included representatives of industry, and the US Food and Drug Administration was convened to identify the major design considerations and clinical and regulatory challenges of central venous catheters for hemodialysis. The base year of the study is 2017, with forecast done up to 2023. The study presents a thorough analysis of the competitive landscape, taking into account the market shares of the leading companies. It also provides information on unit shipments. These provide the key market participants with the necessary business intelligence and help them understand the future of the Central Venous Catheter Market. The assessment includes the forecast, an overview of the competitive structure, the market shares of the competitors, as well as the market trends, market demands, market drivers, market challenges, and product analysis. The market drivers and restraints have been assessed to fathom their impact over the forecast period. This report further identifies the key opportunities for growth while also detailing the key challenges and possible threats. Central Venous Catheter Market - By Type: Peripherally inserted central venous catheter, Tunneled central venous catheter, Non-tunneled central venous catheter. Central Venous Catheter Market - By Procedure: Cardiovascular procedure, Chemotherapy procedure, Dialysis procedure. Central Venous Catheter Market - By Design: Single Lumen, Double Lumen, and Multi- Lumen. Central Venous Catheter Market - By Composition: Polyurethane, Polyurethane/ poly carbonate. Central Venous Catheter Market - By Applications: kidney dialysis, self-treatment at home, chemotherapy for cancer, long term antibiotics to fight infection, lot of blood tests and others. Central Venous Catheter Market - By End User Industry: Pharmaceutical Industry, Hospitals, and Specialty clinics and Ambulance Surgical center and others. The major Key players in this market include: Angio Dynamics, Kimal, Terumo Corporation, C.R.Bard, Lepu Medical Technology, Edwards Life sciences, Vygon(UK) Ltd,Becton Dickinson Company and many more. The market for Central Venous Catheters are expected to progress as key players are expanding production units and taking part in joint ventures for the production of these products. The demand of CVCs is also rising in the hospitalization and specialty clinic centers due to its better physical properties in dealing with veins. This is a positive trend for the CVCs business .CVCs are the prominent way of facilitating fluids, medications, and intravenous nutrition especially for oncology patients and people living with other chronic conditions. CVCs reach into major veins that are designed for long term secure durable IV access. The chances of getting bloodstream infections is very high among the recipients. To combat this situation, vendors are focusing on introducing antimicrobial coated catheters and conducting extensive R&D activities and to minimize or eliminate bloodstream infections. For instance, in 2015 the well-known market player Kimal launched Altius ProActiv+ Antimicrobial CVC at Berlin. This covalent-bonded antimicrobial CVC was especially designed for minimizing the bloodstream infections through its coating. The recent price increase of CVC by the major key players is bound to effect the demand of the market. The rising raw material cost, as most of them are derived from polyurethane and poly carbonate products and due to the increase in transportation costs.